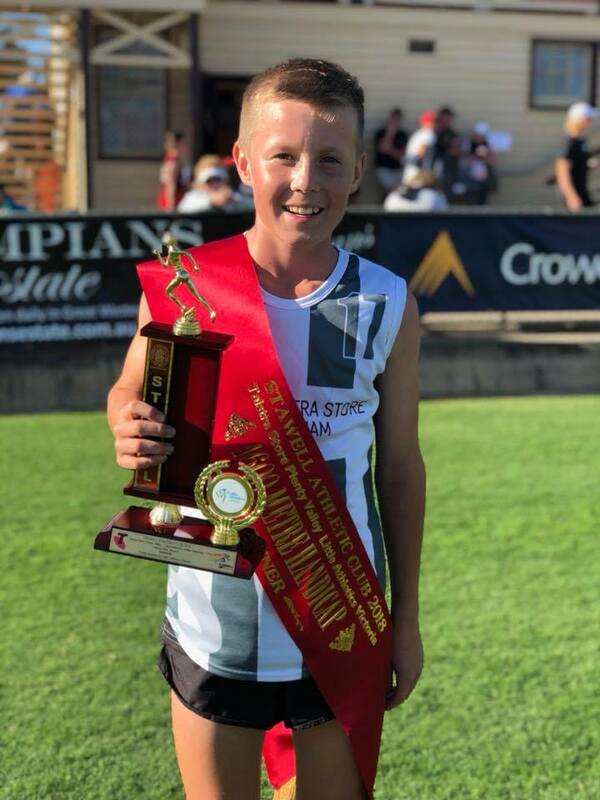 Congratulations to Dylan Scoble winner of the Telstra Store Plenty Valley Little Athletics Handicap – 1600m Final. On Saturday 31st of March Mum, Luke, Max and I arrived at Central Park, Stawell. Max and I were competing in the 800m. I was in the 3rd heat, I finished fourth in my heat, but didn’t make the finals. The next day I was competing in the 100m and the 400m. In the 100m I placed second in my heat, but just missed out on the finals. After the 100m I did the Easter egg hunt, it was a very disappointing efforts as I came out with seven. In the 400m I finished 7th in my heat. On Monday I competed in the 1600m handicap. I started off running a steady place, then at two laps to go Solomon Mieson passed me, I thought he might win. With a lap to go I picked up the pace and caught the pack in front of me, then it was just me and Solomon, at 200m to go I started to catch up to him. Then at the line I just got him by .3 of a second. At the end of the race I got a sash, a trophy and a speaker, I also had to give a speech and if you know me you know that I hate public speaking. 3 races with the top 4 from each race to progress to the final. The 3 heat winners will each receive a $30 Sportsmans Warehouse voucher, with a special prize for the winner of the final. Please register now by replying to the event or comment below to assist with handicapping. Remeber to check the SRC FB page for the latest up coming events and races. It is updated regularly. PLEASE NOTE – We will be having a working bee at the clubrooms in the garden after the handicap. Welcome to another edition of Shepparton parkrun weekly news. We are looking forward to seeing everyone next Saturday. Bring your family, bring your friends and don’t forget your barcode! Main Beach Parkrun, where it all started in Australia. The countdown continues. It’s only 1 more sleep until our 7th Anniversary on the 7th of April. 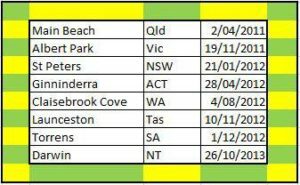 We all know that Main Beach parkrun was the first parkrun in Australia (and then by default 1st in Queensland) do you know which parkrun was 1st in each of the states and territories? See the list below to see if you were correct. GUERNSEY LITERARY & POTATO PEEL PIE SOCIETY. This is a fundraiser for GVCASA organised by Kathy Fuller and Narelle Pell. Please note that you need to book tickets via Trybooking.com/UYLN or at Collins Book Sellers in Shepparton. Did you miss our Super Saver prices? Enter before midnight on Friday 6th April and take advantage of the extended Super Saver prices – simply enter the code SUPEREXTRA for the 10% discount. The Gold Coast Running Festival is perfectly placed to use as a build up for other marathon and half marathon events later in the year. For more information on the event, visit our website or facebook page. Steve Monaghetti on avoiding injuries for Gold Coast. Their are several reasons to run at Gold Coast this year. 1. It’s the 40th year for the GC running Festival. 2. You get to run with Kathy Fuller and Narelle Pell in their 12in12 quest. 3. Top temp is 23 deg in the middle of winter. Early bird entries now OPEN! 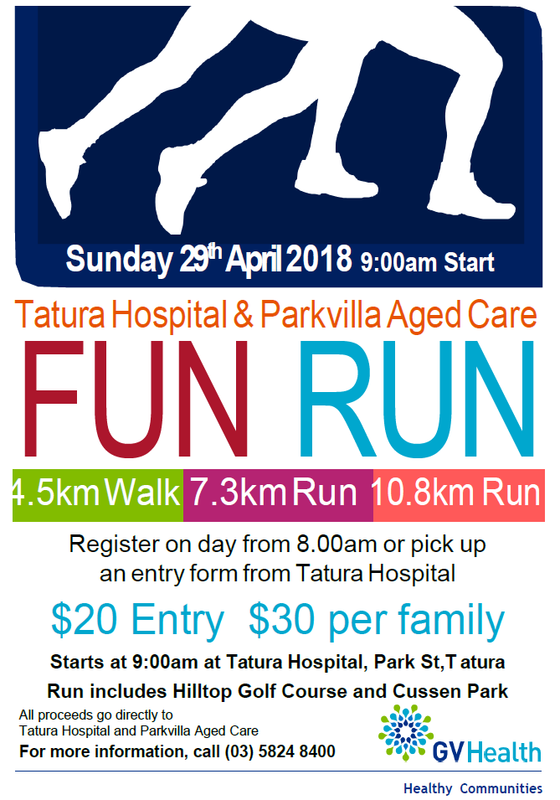 Sign up, save and race Shepparton, 26 August 2018. There is a distance for everyone! 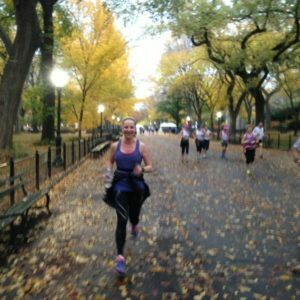 Doing my first half marathon and then my first marathon. Before that I didn’t think or believe I could run either distance. Love running by the sea. However anywhere outside in nature is great. Lucky enough to run my dream marathon in New York 2013. Loved it. Hope to run in Paris one day. People who love running! People who have a go and give their best and enjoy it! People who have pushed themselves despite the odds and keep going..
people who break new boundaries.. So many to mention.. but Kathy Fuller and Narelle Pell currently!!! Those running angels are amazing!! Deeks! And what he does now for indigenous runners! Amazing local runners who inspire me with their commitment and goals, every week, so many in the shepparton runners club and beyond.. thank you! During a long run you will hit a bad stage..a difficult stage..it’s like life.. keep going, one step at a time and you will get threw it and you will even go through a wonderful stage too.. The funniest sign I’ve seen when running was in Brooklyn during the New York marathon , it said “run like you’ve stolen something “..
Running is a gift. It is a gift that anyone can do. Running is a wonderful thing to do and you can do it anywhere. Fast or slow. It gives me the patience to enjoy the scenery, the strength to tackle any distance or fun run, the resilience to keep going no matter what and the joy of a running community like the shepparton runners club, opportunities of fundraising for events, organising events or the camaraderie of my running pals. Many friendships are formed and nurtured through running. It is an amazing thing that anyone can try! This Saturday, be inspired by the Aussie Athletes and get yourself moving. Join other runners, walkers, and rollers at one of the hundreds of parkrun events. It’s free and fun! Off topic – Sam and Tara Hiking Mt Bogong. 3 days, 34 kms, 2250 mts gain and same loss, multiple creek crossings.